Tywin Lannister, the authority of the eternal yesterday, the customs sanctified by their immemorial validity and the habit rooted in men to respect them. Despite all his claims about Family, if you look at his actions he is first and foremost a Fortune sim. He claims family is his motivation but if you think about it, the true motivation is his family's position - the shine, the respect, the superiority. In his traditional mind, a father's job is to be out there working, so he is out there winning the war. He doesn't get to be with his family because his family - daughter and grandson - started the war - and frankly he is far more competent out there than with them anyway. In my game I have freetime, and I made him a Fortune/Family sim. Up to you to decide what you want him to be - yet I don't imagine Tywin Lannister playing with the fridge door or jumping on the couch. This man smiled with his wife, and after she died while giving birth he became forever grim. Now he smiles when he crushes an enemy, and that's it. He smiled with Arya Stark, too, but that is a rare exception. I believe he liked her because she's smart, tough and a good worker - like himself. 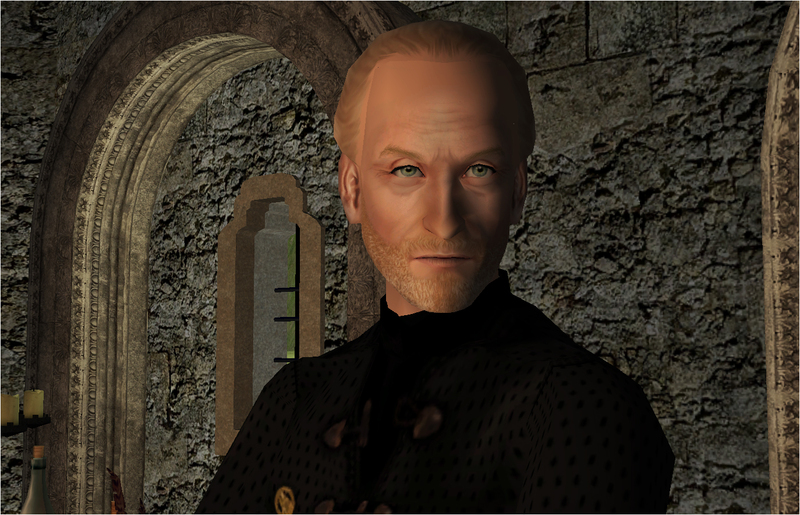 Zodiac : In the sims game, Tywin would be the purest Scorpio. Neat, Shy, Active, Serious and Grouchy. Don't be afraid to give him zero for grouchiness, remember the Red Wedding, Tywin isn't afraid to cheat to win the game. He likes swimming, riding a bike, playing the ukulele and the guitar, poetry, white wine and to sleep early. If we retire, there'll be nobody to play the old wrinklies, and that would be a dreadful shame. Lannisters don't act like fools. The future of our family will be determined in these next few months. Before long I'll be dead, and you, and your brother, and your sister, and all of her children. All of us dead, all of us rotting in the ground. It's the family name that lives on. That's all that lives on. This will be my last war, win or lose. Do you know what legacy means? It's what you pass down to your children, and your children's children. It's what remains of you when you're gone. M'lord. Low-born girls say m'lord, not my lord. If you're going to pose as a commoner, you should do it properly. Any man who must say I am the king is no true king. I'll make sure you understand that when I've won your wars for you. ^ I love this scene so much. Joffrey (young king) doesn't get it. Everybody else is mortified. Look at their faces, lol. Joffrey has no idea what could have happened here, but their faces tell it all. ^ Tywin is so tall and intimidating in this scene! He stays extremely polite the entire time, but he is so cold and unimpressed. To him, Joffrey isn't royalty, he calls him 'Your Grace' but his entire attitude says something else entirely. If you download the Sim of Tywin you get everything, the separate downloads are for those who just want one specific part. The sim you get is an adult. Feel free to turn him to an elder if you want, but elder sims walk, talk and act in a way that I felt unfitting for my Tywin. Face sculpt - by me, with the help of MANY fantastic people! Stuff on pictures - by Maxis, kativip (GOS), Ailias, mustluvcatz, -Maylin- and The Guild Masters (Dark Project). 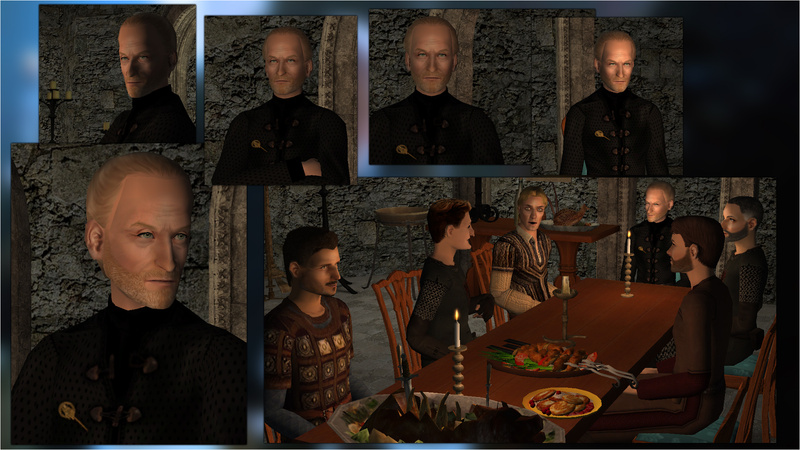 'Lannister Bannermen' on the table picture - my previous sims, modified - Ed Quinn, Lorne, Rahan, Fred as a man, Robin as a man. Pictures of the real Tywin and videos are a property of HBO / Game of Thrones. Setting is a quick lot I made to look vaguely like Harrenhall. If you want it, PM me, I'll look into my backups, if I still have it, you can have it. All the fantastic, patient, kind people who helped me along the way of making this sim, either on the Creator's Feedback Forum, on my thread about mesh problems, or on the Where Can I Find forum! A big, big thank you from the bottom of my heart! This has been team work! My Tywin wouldn't be the same without you! Thank you MTS for the Picked Upload! Thanks MTS for featuring this! 24 downloads and no comments??!!! I can't believe it. I looked at that first picture and thought, "Is that the sim or is that Dance?" I'm still not positive but finally decided it must be Dance since he is wearing armor and last you said you had given up on the armor temporarily. This is such a fantastic job, @billithlith. I'm not playing a Game of Thrones neighborhood at the moment but I'll find a place for Tywin in my game somewhere. He is too good not to. Thank you, thank you, thank you. #3 25th Dec 2017 at 10:33 AM Last edited by billielith : 29th Dec 2017 at 3:27 PM. lol, thank you for that first comment, for your kind compliments and for your help with his nose. And you're welcome, you're welcome, you're welcome, lol. It was an epic journey indeed, nothing about him was just easy or instantly done, every detail required work to end up correctly. And thanks so much, Maxon. You truly solved my problem with the hair by putting my focus on the ponytail mesh. Fantastic job! Thank you very much! Thanks Sandy, I hope you enjoy having the Lannister alpha lion in your game. Thank you! I am happy with how he turned out. It took time and a lot of versions but Mr. Dance finally emerged in that face! lol. Mr. Dance is so amazing indeed, he is an officer of the Order of the British Empire, you know? I really hope he likes this sim. He has been rewarded so many times in his extremely brilliant career. He's been playing the aristocrats in theaters, on tv and in movies since 1974! #4 26th Dec 2017 at 12:32 PM Last edited by billielith : 29th Dec 2017 at 3:28 PM. Thanks so much NixNivis. And indeed, Mr. Dance does a fantastic job playing Tywin. When we see him interact with Arya he indeed shows some emotions. He told Arya she reminded him of his daughter, but Cersei never made him smile nor laugh the way Arya did. I think Arya reminds him of Joanna. But he will never admit that. Joanna's death is the reason he killed his emotions in the first place, and he will not go back there, as he refuses to show any weakness now. 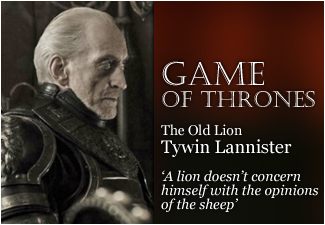 A lot of people admire Tywin's success but I think he is a sad, sad man. Arya is the closest thing to a friend that he had in a very long time. The sim is fantastic! As well as the description and pictures. You've gone a long way from "kinda resembling" to "very-very alike"
It was interesting to watch your work in progress. I appreciated your constructive criticism so, soo much. You were so always on the point. I've appreciated your honesty and your eye for spotting what worked and what didn't. You helped me get this sim better! He wouldn't have been so 'very-very alike' without you! Good job! I liked how you shared pics of your process - it's interesting to see how different creators do things. Thank you Azelanne! 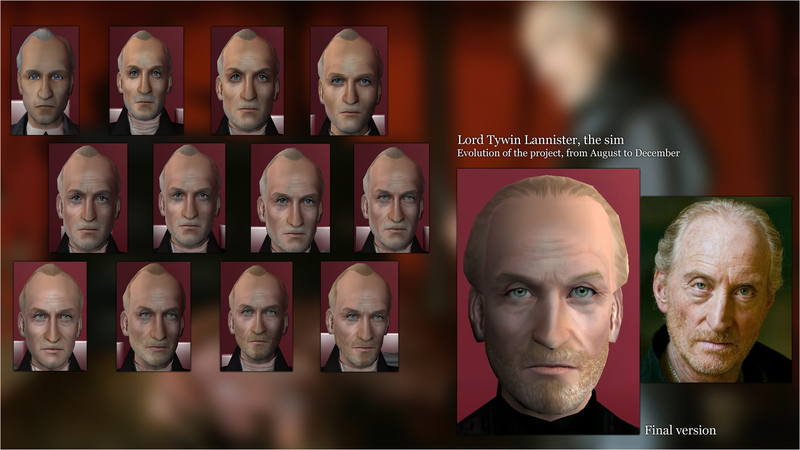 Tywin has certainly been a lot of work, so many details to process. And the game was not made to make sims like him. My facebook friends were flooded with updates every week and some of them are glad that it's finally over, lol. Thank you! You helped me a great deal as well. You helped me see how he needed another hair mesh than the Maxis bald one. In fact I am considering to make a set of his current hair mesh, for other sims. You really did a great job with him. I've been so waiting for this one. He looks wonderful. Thank you for sharing. Thank you! And thanks for your help on the Feedback forum. He smiles a lot as a sim, that's a little weird, lol. Enjoy! I don't think that someone can do a better Tywin Lannister than yours. This is very very good. Bravo and merci beaucoup. Thank you so much! Merci, c'est tr�s gentil! Fantastic job and an amazing likeness! Love seeing your process. It's always fun to see a project from the beginning to the end.. Thank you! And it's true, we rarely get to see the process behind a project. I keep repeating it, but I feel so thankful for all the help I had for this one. People's support felt incredible! In Sims games people can have an idea of the work we do, because we all have to go through CAS. In other circumstances most people would never guess the 'behind the scenes' work. Like for example in Game of Thrones. They work so hard to make it as realistic as possible, not just the actors, but all the people making the sets and costumes. Once I've watched a 'behind the scene' where they were making the prosthetics for the White Walkers. I could never do something like that! It's incredible the countless hours these people can put on each piece! My derring-do allows me to dance the rigadoon around you. But by the time I'm close to you, I lose my desideratum. Absolutely amazing. I don't think I've ever seen a likeness so pure. I'm somewhat afraid of the old man so it will be interesting to see him in my world! Thank you! You are really kind. Thank you very much! He is definitely scary. A difficult person on so many levels! You've done an outstanding job on this. Like Angela Channing in Falcon Crest tv series said once. persistency generates success. I like to see you do Jim Morrison from the doors. Thanks for sharing. Thank you very much, you are too kind. I don't think I will sim any musician soon, but I plan on finishing a sim of the american actor Jack Nicholson. I started making his sim a long time ago, and I have new tools and more experience now. Hum..Jack Nickolson sometimes has a very slizzy look in his eyes. I remember that from this movie can't remember the name where he's a sort of an odd character and as he approaches the female he makes remarks which heart her feelings without him actually meaning to. Anyway, good luck and I think you'll do a good job as i've seen your work. Visit me at sexysims 2 and see what you think of my work on the new bodyshape if you want.